If you have a loose board, you may see what is known as a “nail pop”—that’s when the head of a nail protrudes from the surface instead of sitting flush. You could try simply hammering the nail down, but a better solution is to replace it with a screw, as these little devices are more resistant to popping and therefore more secure. If you’re going to insist on using nails, it’s best to opt for 16-penny galvanized steel box nails, which resist corrosion and minimize splitting of the wood. Be sure to take this occasion to inspect the entire deck. It’s certainly possible that there are other boards that are beginning to develop problems. You can gently test an individual board by carefully placing the weight of your foot on it at the joist and then shifting off it. The board may noticeably come loose. Not everyone is comfortable making quick repairs to the deck, and that’s perfectly understandable. So why not leave it to us? Since 2007, Deck Guru has been in the deck refurbishing business Nationwide. 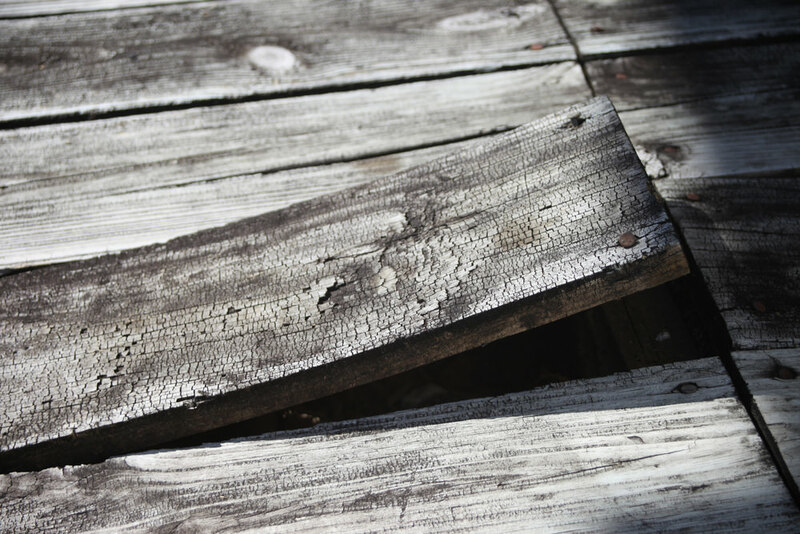 For expert deck services, feel free to call us at 8884297947. Ask us for a free consultation!